The mission of the UCLA Institute of Urologic Oncology (IUO) is to offer patients outstanding, individualized surgical and medical care and access to innovative clinical trials with the overall goal to cure urologic cancers. UCLA's Institute of Urologic Oncology (IUO) brings together a multidisciplinary team of scientists and physicians to develop leading-edge therapies for the treatment of prostate, kidney, bladder and testicular cancers. Disciplines include urologic oncology, medical oncology, diagnostic and interventional radiology, pathology, nursing, basic sciences and clinical trials. "Our goal is to bring all our resources to the patient, rather than the patient going from office to office to see everyone they need to see" says urologist Arie Belldegrun, M.D., the institute's director and a researcher at UCLA's Jonsson Comprehensive Cancer Center. From left: IUO associate director Stuart “Skip” Holden; Mark S. Litwin, UCLA Urology chair; and IUO director Arie Belldegrun. Patients also benefit from the institute's top diagnostic tools, expertise in robotic and minimally invasive surgery and the combined experience of the experts, who often treat the most complicated urologic cancer cases. In addition, a joint, multidisciplinary board representing all genitourinary specialties meets at the institute to discuss complicated and challenging tumor cases referred to UCLA. 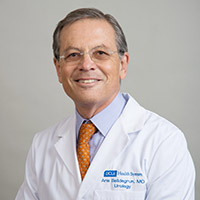 "Collaborating with a diverse team of UCLA medical specialists, the IUO is poised to become the global leader in targeted areas of urologic-oncology, providing patients with the best and most comprehensive care under one roof," says Mark S. Litwin, MD, MPH, chair of UCLA Urology. Director, Institute of Urologic Oncology.